January 12, 2015 -- Links International Journal of Socialist Renewal/Green Left Weekly -- Maithripala Sirisena has taken office as president of Sri Lanka, after winning the election held on January 8. Sirisena obtained 51.28% of the vote, defeating incumbent president Mahinda Rajapaksa, who got 47.58%. Seventeen other candidates got a total of 1.14% of the votes between them. Duminda Nagamuwa, representing the Frontline Socialist Party, got 0.08%; Siritunga Jayasuriya of the United Socialist Party got 0.07%; and Sundaram Mahendran of the NSSP (New Socialist Party) got 0.03%. Rajapaksa had been elected president in 2005, and re-elected in 2010. In his first term he presided over the most brutal phase of the war between the Sri Lankan government and the Liberation Tigers of Tamil Eelam (LTTE). The LTTE was formed in the 1970s to fight for an independent Tamil homeland in the north and east of the island of Sri Lanka. It was created by Tamil youth in response to discrimination against Tamils and the violent repression of peaceful protests. From small beginnings it grew into a powerful armed force. Opposition-backed presidential candidate Maithripala Sirisena is supported by some Tamils and human rights activists, but others say he represents little different from the current regime. January 2, 2015 -- Green Left Weekly -- Sri Lanka's President Mahinda Rajapaksa is being challenged by Maithripala Sirisena, who was until recently one of his ministers, in the January 8 presidential elections. However, many Tamils and leftists see little difference between the two. Sirisena is being supported by the opposition United National Party, and has promised to appoint UNP leader Ranil Wickramasinghe as prime minister. There are 16 other candidates. Sirisena has promised to abolish the system of executive presidency, which concentrates power in the hands of the president, and replace it with a system where the parliament has more power. This change has long been advocated by many human rights advocates, who think that reducing the arbitrary power of the president would improve the human rights situation. Some human rights advocates are supporting Sirisena for this reason. However the Tamil Civil Society Forum sees no real difference between Rajapaksa and Sirisena. August 21, 2012 -- Links International Journal of Socialist Renewal -- Leader of the Nawa Sama Samaja Party (NSSP) of Sri Lanka, Dr Vickramabahu "Bahu" Karunaratne (picture above), was invited to address the Tamil Eelam Solidarity Organisation (TESO) conference in Chennai, Tamil Nadu, India, on August 12, 2012. The conference was organised by parties in Tamil Nadu sympathetic to rights of the the Tamil people in Sri Lanka. At first Bahu was denied a visa by the Indian government but after widespread protests he was issued a visa. The NSSP leader's speech is reproduced below. I am very thankful to the organisers of the Tamil Eelam Solidarity Organisation (TESO), in particular to Mr. Radhakrishna, for giving this opportunity to participate in this event and to explain the sufferings in my country. They had to under go many difficulties fight hard and over come many obstacles to organise this meeting. I also faced difficulties to come here. Though many Tamil National Alliance MPs were willing to come, they could not cross the barriers. Sri Lanka: Will the new Frontline Socialist Party revive the left? April 14, 2012 -- Dbsjeyaraj.com -- More than 5000 people packed Colombo’s Sugathadasa stadium (photo above) for the inaugural conference of the Peratugami Samajawadi Pakshaya (Frontline Socialist Party, FSP) on April 9, 2012. Most were members and sympathisers of this new left party – a breakaway from the Janatha Vimukthi Peramuna (Peoples’ Liberation Front, JVP); but many representatives of other radical left parties, left intellectuals and progressive social activists were also in attendance. The emergence and consolidation of the FSP is an important and hopeful development for the revival of peoples’ movements in Sri Lanka in the post-war era, following decades of retreat of the labour and left movements. Underlining the internationalism of the new party, and its understanding of the relationship between national and global struggles against capitalism, the convention was dominated by speeches and messages from international guests and representatives of FSP branches in England, France and Italy. Greetings were also delivered by left groups within Sri Lanka, mainly of Trotskyist and Maoist lineage, including Vickramabahu Karunarathne on behalf of the Nava Sama Samaja Party (NSSP). Solidarity with journalists in Sri Lanka, defend democratic rights! Protest abduction of socialists! UPDATE: The two comrades of the Frontline Socialist Party, Premakumar Gunarathnam and Dimuthu Attygale, have both been released, on late April 9/early April 10. Gunarathnam has been deported to Australia (he is an Australian citizen). Without doubt it was the high level of international attention and the unprecedented solidarity across the political divide in Sri Lanka that secured their lives and liberty. April 5, 2012 -- Democratic freedoms are increasingly under attack in Sri Lanka. In a climate of intense chauvinism, critics of the government and its increasingly authoritarian and repressive policies are more and more threatened. Even journalists who have already been forced into exile are targets of threats and smear campaigns. Government members have personally called for violence against media personnel that have raised criticism of the Sri Lankan government or that have drawn attention to violations of Human Rights in the country. 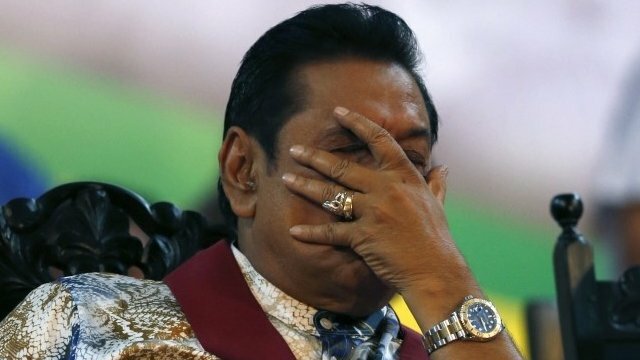 Del mismo modo que Israel usa a los asentamientos judíos para separar las áreas habitadas por palestinos en pequeños fragmentos, intentando así imposibilitar un estado palestino, Sri Lanka utiliza los asentamientos singaleses para separar las áreas tamiles del norte y del este de Sri Lanka, con el objeto de imposibilitar un estado tamil independiente. 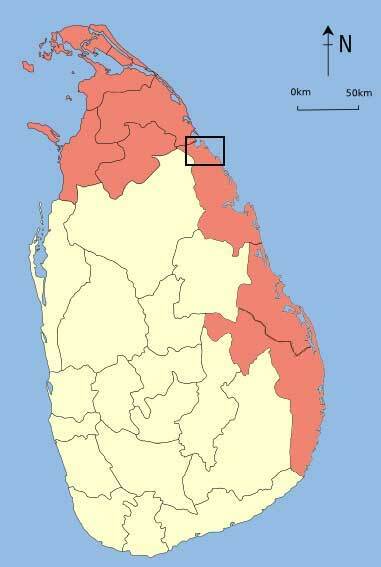 Within the box is one of the Tamil areas targeted by the Sri Lankan government for Sinhalese settlements. Map from Tamilnet. March 14, 2011 – Links International Journal of Socialist Renewal – The Tamilnet website has accused the Sri Lankan government of waging a "colonisation war" against the Tamil people of the island of Sri Lanka. The government has been establishing Sinhalese settlements in traditional Tamil areas. The website compares this to Israel’s policy of establishing Jewish settlements in the West Bank, saying: "Sri Lanka is aiming at creating an Israeli model situation as fast as possible". May 30, 2010 -- This is a very useful book for those wishing to gain a thorough understanding of the history of Sri Lanka since its independence from Britain in 1948. The 27 authors in the collection are diverse in their ethnic backgrounds, including Sinhalese, Tamils and Muslims from Sri Lanka, as well as outsiders. They are also diverse in their political outlook, including liberals, Marxists and Tamil nationalists. Vickramabahu Karunaratne, the presidential candidate for the NSSP. 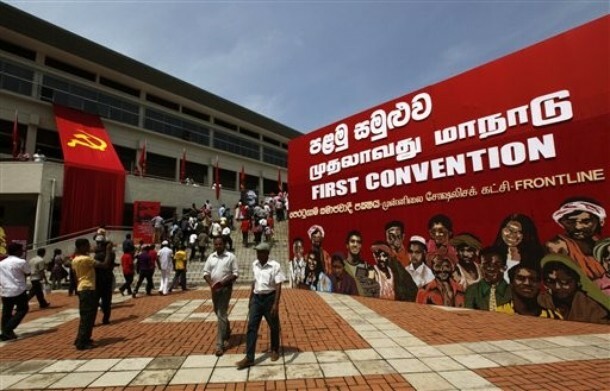 March 20, 2010 -- The Left Liberation Front (LFF) is contesting 19 seats in the April 8 parliamentary elections in Sri Lanka. The LLF, an electoral coalition comprising the Nava Sama Samaja Party (NSSP, New Socialist Party), the Tamil National Liberation Alliance (TNLA) and the Socialist Party, stands for the right of self-determination for the oppressed Tamil people of Sri Lanka, freedom for political prisoners and an end to the state of emergency. The NSSP and the Socialist Party are Marxist parties based in the predominantly Sinhalese south of the island of Sri Lanka. The TNLA is a Tamil nationalist party based amongst the Tamil people of the north and east of the island. Sydney, May 1, 2009. Photo by Peter Boyle. May 13, 2009 -- The statement below was presented at a press conference by Vickramabahu Karunarathne (``Bahu''), general secretary of the Nava Sama Samaaja Party (NSSP, New Socialist Party). It was first published at Liam Macuaid's blog. Below the statement is a document that outlines the NSSP's position on Tamil national self-determination.